If you have a garden at home, then you know that there are a lot of things that contribute to its look. While the plants make up for a large part of the appeal of any garden, they’re not the only things that can change the look of your landscape. Garden Edging can also prove to be of great help in the garden. Especially since it serves multiple purposes. You don’t have to invest a lot of money and effort into building landscape edging. In fact, there are a few landscape edging ideas that are really affordable and beautiful, and we’re going to present you with 9 of them today. The first of the landscape edging ideas we have for you today is also one of the cheapest ones to create. All the materials you need for it are some planks. Take the planks and stick them into the ground surrounding the are you want to enclose. This landscape edging is very simple, but it looks great and costs very little. What we love most about the design above are the different sized planks. You just need to cut them to different lengths beforehand. We think alternating the sizes will provide your landscape with a much more unique look. 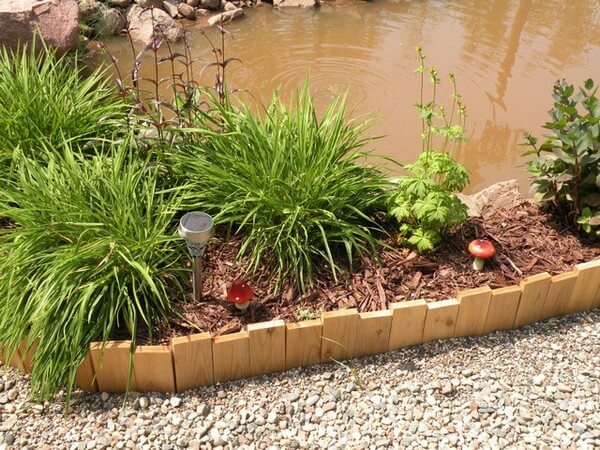 We also like the fact that due to the material you have to use for this DIY (planks), the edging looks like a miniature fence for your garden. If you needed ideas, you could try to recreate the landscape in the image above. Just place gravel on one side of the edging and mulch on the other. This will provide a lovely contrast that will make the edging stand out even more. If you’re looking for landscape edging ideas that can provide your garden with a neat addition, then this one is definitely a viable option for you. Whether you have some terracotta around the house and you have no other use for it, or you buy some cheap pieces, this idea shouldn’t cost you much. The terracotta pieces are really easy to install, so this means you won’t be spending a lot of time trying to create a cool landscape edging. As you can notice from the image above, the terracotta was used to separate the lawn from the flower beds. This is only one of the many uses of this type of landscape edging, so feel free to use your creativity and come up with your own ideas. We have to admit, terracotta seems like the perfect material to make the transition between a neatly trimmed lawn and a collection of multicolored flowers. Plus, its color is quite muted, so it doesn’t steal the show which allows the flowers to truly shine. 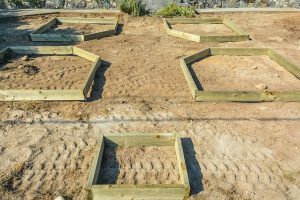 For the people who wish to find some landscape edging ideas that can complement raised garden beds, you might want to consider this one. Raised garden beds can work wonders in sprucing up the look of your garden. Which is why we think you should take things even further by adding a creative and unique landscape edging. 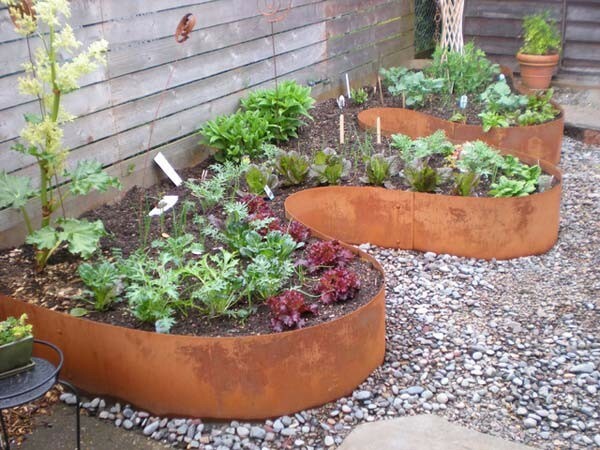 One idea would be to use rusted steel in order to surround your garden beds. While you could simply place a straight steel panel and create a more traditional garden bed, doesn’t the idea in the image above seem better? 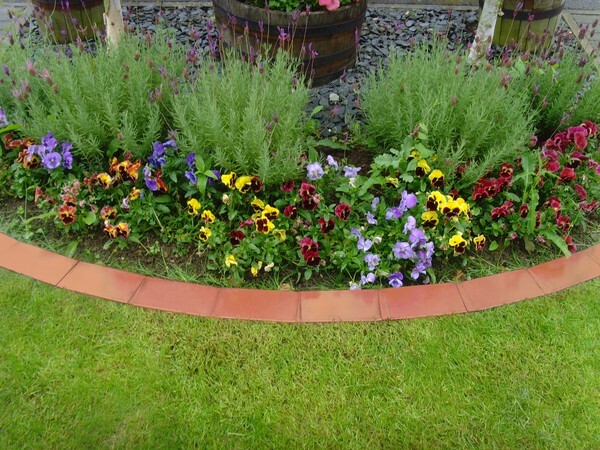 An irregular and wavy landscape edging is definitely going to become a focal point of attraction in your garden. The fact that the edging is made of steel, and one that is full of rust at that, provides a unique spin to the whole concept of garden bed edging. If you’re not a fan of the look of rust, you can always get brand new stainless steel panels, or you can clean old ones before using them. Are you into rustic looking landscape items? Do you enjoy the natural look of forests? Then you’re going to love this landscape edging idea. It’s the cheapest out of all the landscape edging ideas we’ve discussed up until now. It’s one of the easiest ones to install as well. All you need are some logs which you can either buy or if you’re lucky enough, acquire for free. As you can see, since the process of arranging the logs is so easy, you can use your imagination and creativity and come up with different arrangements. For instance, you can simply lay the logs on the ground horizontally and create longer and larger edgings. Another option would be to cut them shorter and place them vertically. This would create a design similar to the one made using the planks except it would be thicker and have a rounded shape. If you want to go for the full natural look, we advise you to keep the logs as they are. However, if you’re interested in polishing them a bit, or even providing them with some color, you could always paint over them or decorate them as you wish. 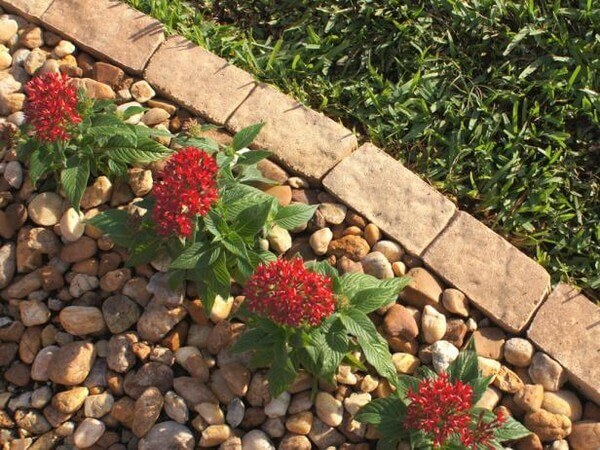 A bit similar to the terracotta landscape edging borders, but definitely not the same, a brick landscape edging is the perfect option for people who are looking for unpolished and natural-looking landscape edging ideas. As you probably already know, bricks come in a lot of different shades, from a more intense orangey color to a muted beige one. This example used beige bricks. They are between a patch of grass and some lovely red flowers. We can’t talk about this edging further without also mentioning the fact that the bricks are almost the same shade as the pebbles used to surround the flowers. The idea creates an overall appearance of harmony. This is accentuated even more by the way the sunlight falls on the edging. If you’re looking to provide your garden with a warm glow, we strongly recommend this type of landscape edging. 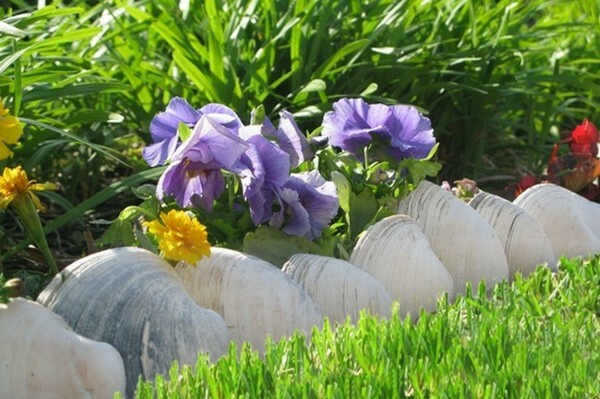 If you’re on the lookout for landscape edging ideas that won’t take up a lot of space in your garden, you need to be using shells as edging. If you live somewhere near the ocean, or if you’re planning a trip there soon, consider collecting some shells (which can be a fun and relaxing experience in itself) and using them to create a lovely landscape edging. The shells don’t all have to be similar. In fact, the more diverse the better. All you have to do to create this landscape edging is stick the shells into the soil carefully. Just make sure you don’t break them in the process. This type of edging works best in gardens that contain mostly small flowers, but you can make the most of it anywhere you want. A landscape edging doesn’t have to be extremely visible in order to look nice and to meet its purpose. As an extra tip for people who are crazy about colors, you can try to paint over some of the shells and combine all sorts of intense shades. 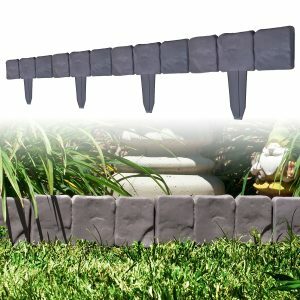 This unique landscape edging idea is definitely one for the car enthusiast. 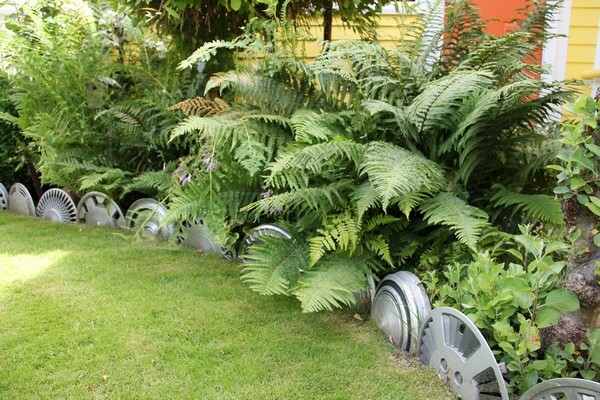 If you have old metal wheels around the house and you’ve been trying to find a way to repurpose them, this is your chance. 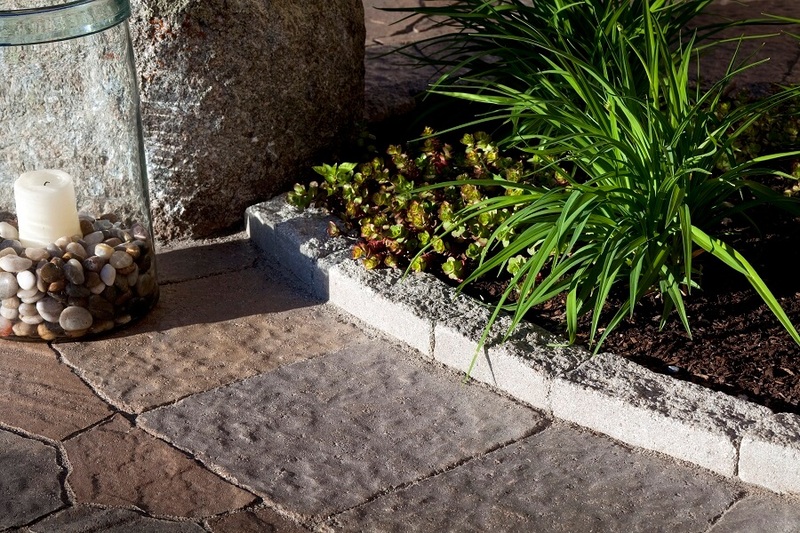 You can use them as pieces of your brand-new landscape edging. As in the case of most of these creative garden edging ideas, all you have to do is stick the pieces into the ground and surround the area you want to separate. This type of landscape goes in a more futuristic direction. That’s first of all due to the shape of the wheels, and second of all due to the material and its color. As you can see in the image above, the best way to make this edging shine and help it complement the look of your garden is to place it where it can be surrounded by a lot of greenery. Of course, you can also plant colorful flowers around it, but you have to admit it looks great in between the lawn and the tall ferns. If you are not interested in cars, you should think about the hobbies that do interest you. There may be a similar way to incorporate it into your garden. This border is one of the simplest ones to use that we have mentioned. It is readily available from gardening supply stores and easy to install. The ease of installation is one of the reasons it made our list. It is the quickest way to give your landscape edging a quick boost. It looks great as well. Instead of having a plain plastic border, we love this landscape edging idea much better. It looks like stone, and it pops much more that a simple border or no border at all. Make sure to give this one a shot if you need a quick fix to your landscape edging. There are plenty of landscape edging ideas out there, but this is one of the very best. 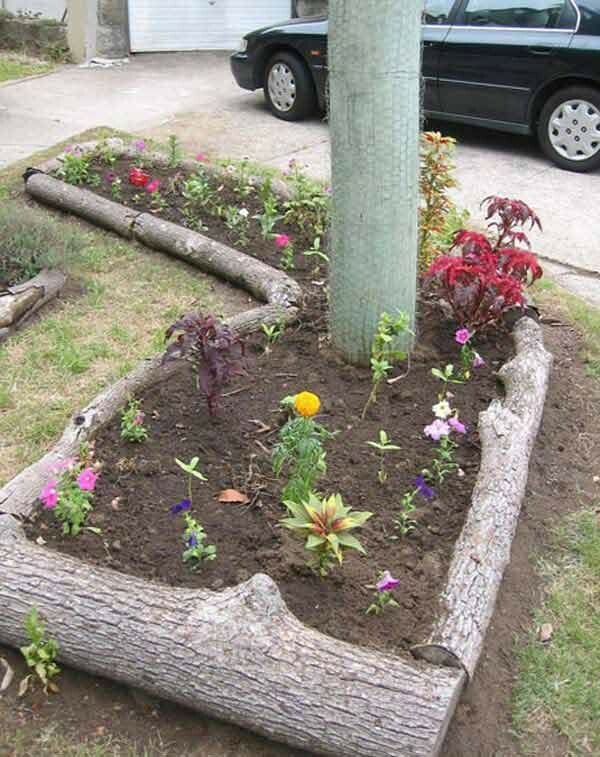 This is going to work very similarly to the log edging idea we mentioned earlier. Bigger landscape edging ideas really help the garden pop from your yard or other landscaping. Check out the image below. In this photo, the garden and landscaping are obviously not complete. The landscape timbers are used to help separate what will be grass from the garden just like most landscape edging. Since the landscape timbers are so large, they pop much more than something smaller like some of the precious edging ideas. We have covered many other projects using landscape timbers as well. We hope today’s guide to 7 landscape edging ideas has managed to prove to you that you don’t need a lot of money or have to put in a lot of effort in order to build a cool edging for your garden. The only thing you need is a dash of creativity and a desire to make your garden stand out. There’s a type of landscape edging out there for everybody, so regardless of whether you like wooden edgings, brick ones, or you’re a fan of steel, you’re going to find a type of landscape edging that suits your needs.